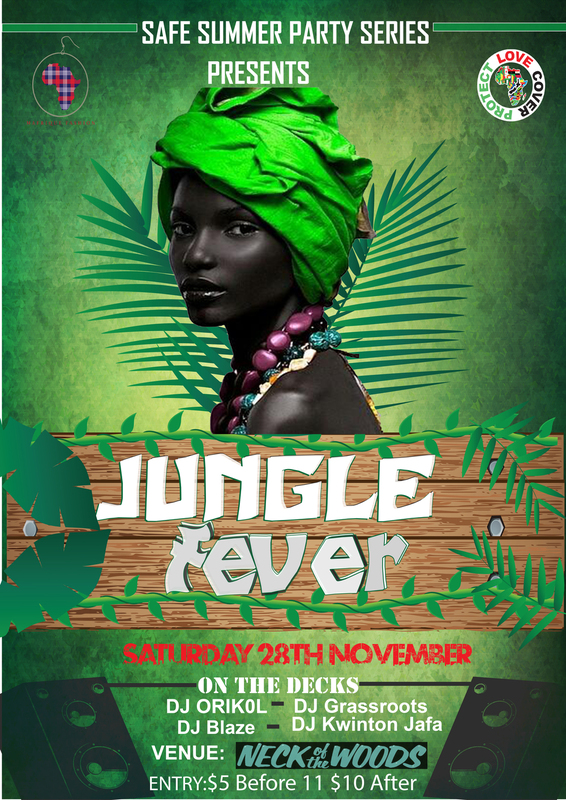 SUMMER is the best time of the year and we are ready to rock out starting with this killa party JUNGLE FEVER. The first of Safe Summer Party Series' Afrobeat parties will be held at Neck Of The Woods. Drink specials, African food, great vibes and serious dancing will be going down. This will be the second year for the Safe Summer Party Series, jam packed with different genres of music tied around AFROBEAT as their base and safe partying promoted. Theses guys support their crowd having fun but also acknowledge the cons that occur during nights outs. Brought to you with the help of Love Cover Protect, UBER Taxi, Auckland Transport and Momma G's Boutique. It's all about safety whilst partying so the following elements will be implemented to achieve a lower rate in DUIs, unplanned pregnancies and STI prevention; condoms, bus timetables, food @$5, discounted Uber taxis and a whole lot of H2O.